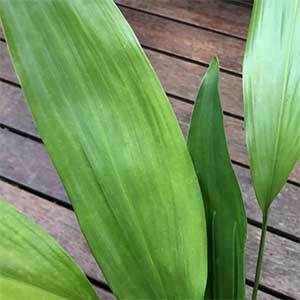 As an indoor or house plant or as an outdoor plant, in shaded and tough conditions the Cast-Iron Plant (Aspidistra elatior) really lives up to its name. Readily available for sale online the Cast Iron Plant thrives on low light, poor soil, lack of water, cold, hot these plants can grow just about anywhere, but do best out of the full sun. The old fashioned Aspidistra, with its large lance shaped leaves is an easy care plant for indoors. Popular in Victorian times this is an excellent plant for low light situations. Its deep green foliage was thought to bring a tropical or exotic look here it earned the name ‘Parlour Palm’. The flowers are rather insignificant and are often not seen at all. They appear near the base of the plant in early summer, however they do not appear regularly. Remember that this is a slow growing plant and can take 8 – 10 years to make a mature plant. And this is why we do not see good specimens available for sale very often. The botanical name is Aspidistra elatior and it originally comes from Asia. It has earns the name of ‘Cast-Iron Plant’ for a number of reasons. Low temperatures are not a problem although freezes and frosts are. It is almost pest and disease free. Like Cast Iron, it is tough and hard to destroy. Growing condition and care are simple, anywhere out of the full sun, not fussy about soil, fertiliser or water, but will do better if treated well. Although this tough plant will grow in poor conditions, it will look a lot better and put on more growth in good conditions. As it is a slow grower we suggest a little extra care. If you using this as an indoor plant try the following care instructions. Use a good quality potting mix, free draining is best. Move the plant outdoors for a few days in mild weather. A little fresh air always helps. Prune away dead foliage at the base as required. Fertilize with a slow release fertilizer in spring and early autumn. Applications of seaweed fertilizers every month will help. Easy to propagate by division of established clumps. This is a plant that grows from rhizomes so simply dig or remove from the pot and divide. A. elatior ‘Variegata’ has attractive green and striped foliage and like the species will reach .5m in full growth. A. elatior ‘Asahi’ has lime green striped foliage. A. elatior ‘maculata’ has green spotted foliage these two are not as readily available for sale.